It is bound to happen, the Grammar Police should be closing in on the title to this Series: Who is the Wise? Even more looked upon should be the book of the Bible from which this Series was developed – on purpose all references come from Ecclesiastes 8, with no deviation. The definitions developed for the six (6) words are targeted and come directly from this specific passage as well. Who is as the wise man? 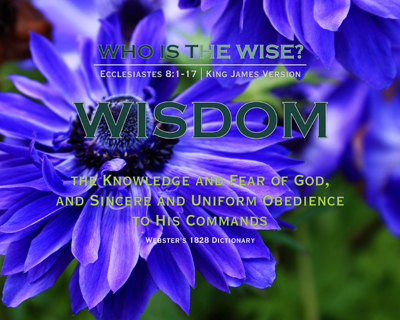 Some may think that the natural thought would be “Who is doing as this Wise Man?” My challenge is shorter and MUCH more pointed – which is why there are definitions – our consideration of how we are actually being wise in this biblical sense. We MUST know Someone to be Spiritually Wise, for it is One of His Qualities – that Someone is our Heavenly Father and Creator God, made possible through Salvation, provided by His Son – Jesus Christ. Wait, wait, wait a minute – isn’t this an Old Testament Book of the Bible?! Matter of fact, YES it is. And, what a Book it is! This passage is exceptionally beautiful because of the spoken reflection that a “wise” man is of God’s reflection to those who are around this man. Even when others don’t know God the Creator, they can “see” Him through the life, actions, spoken words, obedience and even unspoken words. We can see the work of the Lord in and through others if we are willing to look for it – sometimes, we don’t even have to be looking, it is just that obvious. Those “things” which were plainly seen then for a person to do right in this Old Testament time are as prominently seen today as the Christian has the Holy Spirit indwelling them. While good times are an indicator for the Holy Spirit to show through, it actually is all the more so during those times of duress where being Spirit controlled shows through even more abundantly. Remaining in His Control is more noticed and actions under more scrutiny as people just seem to pay more attention when things are falling apart. The two lists that follow, give a preview of what this Series contains. There are six (6) definitions and fifteen (15) passage headers given, each denoting a specific and unique take-away from this incredible chapter in the Bible. My hope is that each individual that happens upon this Series will be intrigued enough to read it and see “Who is the Wise?”. Many have said that the Bible is difficult to read and even more difficult to understand. From differing views and vantage points, that can be understood, but – the Key is needed to unlock it for all of us. This chapter, Ecclesiastes 8, is one that has a wealth of information in it for certain, but it has EVEN more than that – it has a story about life, including then, when Jesus would come and even now. That key, see I didn’t forget, is the indwelling of the Holy Spirit. As Christians, we already HAVE Him – we just need to learn to listen to Him. NOTICE: I did NOT say “we need to learn how to use Him”. One of the things that a person will see though this specific chapter of Ecclesiastes is the Holy Spirit in our lives – that is the WHOLE point for us looking at it in this Series. We are forgiven Eternally as a Child of the King because we are SAVED as Christians. Read (or re-read) the chapter with this in mind – a whole new perspective should open up – people will see in you, what is REALLY in YOU. Love the Lord? Others will see Him in YOU! Walk with Christ daily? Others will see Him walking with YOU! Whatever level of Relationship with Christ you have, others will SEE and be able to TELL what He means to YOU by what you DO! He wants to be FIRST in every aspect of our lives, especially the ones where we are not sure what all is going on, but we are TRUSTING Him to Lead us through. I want that for me, how about you? Now, Who is the Wise? That is ONE tall THREE letter WORD! Realizing that is humbling and should cause us to renew our Altar of Sacrifice. Those additional items are just a beginning place in describing my “all” which needs to be place upon the Altar. While we today do not have a “proverbial” altar that we lay down a “sacrifice”, we do have the One who IS the Altar, IS the Sacrifice and IS the Saviour! The verses of Scripture shared in this Series are ALL about what that Sacrifice has done for YOU and for ME as Christians. There are twenty-three (23) areas covered in the Series images, from “the things” which we have done to “how quickly” He will return to call up His Bride – the Church – You and Me as Believers. The challenges presented in this Series are only provided for by the Son of God, whom we must go to, in order to receive the Eternal benefit. Before the very foundations of the world, there was a manner and way provided such that we might have Fellowship and be able to Commune with our Heavenly Father. He satisfies all the requirements for those that came before us, our generations and those who will follow, until His Return. The Lord provided His All, His LIFE, so that we would have the opportunity to gain Eternal Life – FOREVER – by being our Altar, the very Sacrifice which covers it all and by being the ONLY One Worthy to be the Saviour of the World. The VERY least we should do as Believers is to go to the Altar, giving Thanks, pleading for Forgiveness, seeking Power and dedicating our Entire Lives to Him. By doing so, other areas will become known, greater levels of commitment will be made and we will find ourselves more like Him than even before. The following Theme and Series listing of key words & phrases total twenty-six (26) items that every Christian should take the time to review, inspect and determine to apply to our lives. Each of these provide a glimpse of how Good God the Father has been to us and show us just how much Jesus cared for each of our very souls, as He was willing to die to provide the opportunity for us to gain an Eternal Life with Him Forever one day. What does “all” really mean to you? For that matter, what does “all” mean to me? Is there that one “little” thing that is excluded or hidden away that hasn’t been given over to our Heavenly Father? Have we given in to serving with limited Power from on High because we will not submit fully to Him? Will we determine RIGHT NOW that everything is “on the table” so to speak and that we will stop “holding back” from Him what He knows already we have up to this point refused to let Him handle? We DO NOT have to continue wondering, thinking, living with or in limited Power, Grace or Forgiveness – our Heavenly Father can handle ALL that we will bring to Him. 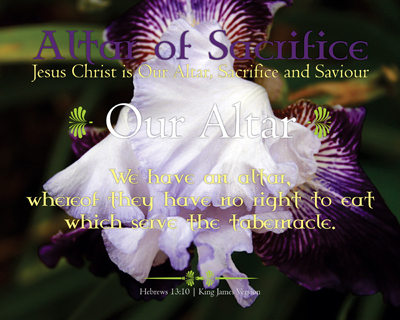 We must humble ourselves before Him and renew ourselves before our Altar of Sacrifice. The first Series to be published for the new year is one that comes from a long search for a few answers as this past year came to a close. In that search came a few passages of Scripture that rang my bell so to speak, providing a very sound manner in which to consider why my answers were so long in coming on matters which were very important to me. My time in study, prayer and writing seemed an escape from those matters, which were picked back up sometime during the day – everyday, as if I knew they were not supposed to be carried with me into the Master’s dedicated time. Therein was my trouble – I’d not taken them fully into the Master’s presence – they were remaining with me, somehow they were being considered “mine” in a manner of thinking. This Series focuses on a specific chapter in the New Testament, I Peter 2. As I happened (nothing we happen across is an accident as Christians) to run across the chapter, my brain kicked into gear, so did the Holy Spirit within me with these simple words: “Will you NOW listen to me as I speak to you?” Plain as day, everything stopped for those few moments as the words jumped off the page at me – several verses struck cords with me… For my wanting to do something with a matter that was “supposed” to be in my hand, it became very clear that what was being held onto was eating at me and robbing me of precious joy. Along with two other chapters, Romans 13 and Jude 1, a commitment has been made (even committed to an accountability partner) to be read, studied and prayed over each day until the matter is resolved within me and no longer is picked up or has influence over me. It is NOT a New Year’s resolution, but rather a dedication and commitment to the Lord that He will be trusted to handle this matter in a whatever manner He deems necessary or allows. What was and is continuing to be done, is all known to the Lord – there are no surprises with Him. I have to answer to Him for me, for which the commitment is to cling to His Word, His Provision, His Mercy and Grace. No matter the challenge, which there are five given to us in the opening verse of I Peter 2: malice, guile, hypocrisies, envies & evil speakings. God’s Word is the sure place we can not only refer to, but we can take refuge as we are both taught and protected by keeping ourselves immersed in it daily. Sometimes, as is being done in my own personal case, repeated review, learning and placement may be needed to help us chart our way through the rough waters of life at times. We will not be perfect while here in this world, but we should also understand that the Bible is the TRUTH and God’s Word is Incorruptible. The more of the Word we learn, study and hide within us, the less likely we are to be corrupted by worldly trials, tribulations and will be more aware of those things that would pull and tug at us to keep us away from His Word, spending time with Him in Prayer and Listening to the Holy Spirit as He speaks to us each day. 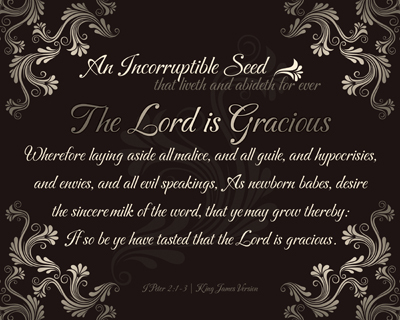 Indeed the Lord is Gracious. This Series is comprised of three sets of images, including: Series Scriptures, Definitions and Supporting passage verses, each consisting of ten (10) items. The original set was developed from I Peter 2:1-25, the entire chapter. The divides are made at supporting thoughts, which makes ten even groups of verses. Is there something that you may need help with as this year has just begun? I’ve found through years of study that there is this Book that is most Amazing – having answers to questions that would “seem” impossible to be contained within it’s pages… the Holy Bible, God’s Spoken Word. One must have only one interpreter to utilize this Book of Wisdom, the indwelling of the Holy Spirit, He is the Key to unlocking the mysteries shared in the Pages of the Good Book. Access to the Interpreter is made possible by placing one’s Faith in the Son of God, the Lord Jesus Christ. Through Salvation we have open access to the Father, the God of All Creation. There is NOTHING our Creator cannot handle, nor is there anything He doesn’t make provision, but we have to be willing to go to Him, share with Him and Listen to Him. Is there something that you are struggling with that you’d really like for someone to handle for you? If so, let Him take care of it. He may use you in the solution, but He may not – let Him Teach you through His Word how He wants you to handle it. Do you know someone who would benefit from this Series? If so, please share this Series with them.